This entry was tagged Jesus, Jonah, stillbirth. Bookmark the permalink. 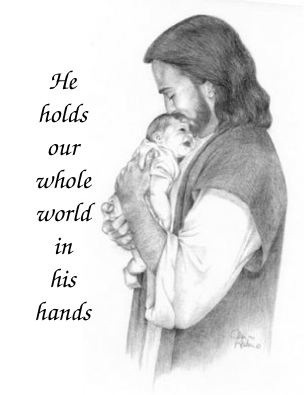 I would love to have a print of “He holds our whole world in his hands”. Where did you get the image? It’s so perfect. I found it online and then my mom added the words to it for Jonah’s funeral. If you give me your email address or find me on Facebook, I can message the image to you. If you want to print it you’ll want a large copy of it so it isn’t all pixels. I’m glad you like it! It has given me great comfort over the years….